We all know that dogs are amazing. 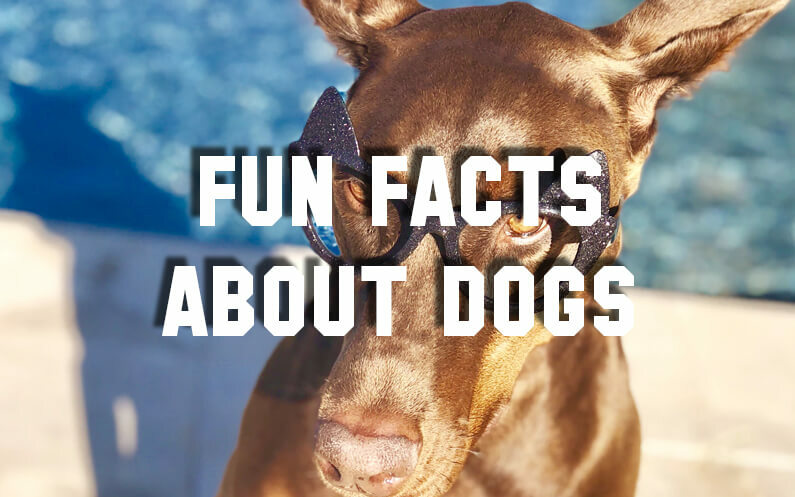 Even as close as we are to our trusted companions, we think you may not yet know these fun facts about dogs. Did you know that dogs can learn up to 1,000 words? If you’ve ever thought that Fido understands you, it’s because he does! Have you ever seen a dog waving his tail in a complete circle like a helicopter? That behavior is typically a sign of a particularly friendly dog. It also shows a genuine happiness to see someone special to them. Learn more about helicopter tail waging here. Did you know that a dog’s nose print is unique like a human’s finger print? Wondering which of your pups stole the cookie from the cookie jar? You can nose-print them to find your culprit. (Just kidding, of course). Dogs’ noses secrete a thin layer of mucous. This mucous helps them to absorb scents. When your dog licks his already wet nose, it is to sample the scents through his mouth. The Greyhound, the fastest breed of dog, can run as fast as 44 mph. It is for this reason that extra care is advised when walking a greyhound or leaving him in a fenced yard. Because they are bred to run, finding them after a break-away can prove difficult. Did you ever wonder why dogs curl into a ball when they sleep? They do this to protect their organs. This behavior is an instinct and a carry-over from their days in the wild. Strange as it may sound, dogs have three eyelids. They have an upper lid, a lower lid and a third lid. The third lid is called a nictitating membrane or haw. The haw helps keep the eye moist and protected. All dogs have this membrane found in the inner corner of the eye. It is only noticeable when drawn horizontally across part of the eye. Did you know that Dalmatian puppies are born with completely white fur? Their spots begin to appear on their fur with age. The first spots appear after three to four weeks after birth. After about a month’s time they have almost all of their spots. However, more spots will slowly appear throughout their life. Have you ever watched your dog kick backward repeatedly after potty time? This behavior is not to cover it up, as often thought. It is to mark their territory using scent glands in their feet. A 2015 study shows that dogs show voluntary unselfish kindness towards others without any reward. This one fact is one that dog lovers have known for a long time! If you have questions about fun facts about dogs or general questions about pet care, you can contact Kara Jenkins, Owner of TLC Pet Sitter. We are also available by email at info@tlcpetsitter.com. View more of our articles on pets here.